Porsche has introduced two new models to the 911 range – the 911 Targa 4 and 911 Targa 4S at the 2014 North American International Auto Show. Like the legendary original 1965 design, the new models feature the distinctive Targa roof bar, a movable front roof section, and a wraparound rear window. Both models combine the classic Targa concept with cutting edge, innovative roof technology. The roof segment can be opened and closed in 19 seconds at the push of a button. The roof system stows the Targa top behind the rear seats. 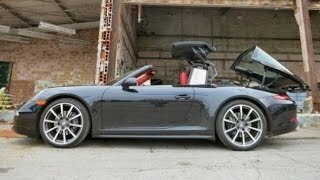 The powerful 911 Targa 4s is powered by the 3.8-liter horizontally opposed 6-cylinder engine delivering 400 bhp (298 kW). It will accelerate from 0-60 mph (0-96 km/h) in 4.2 seconds and is capable of a top speed of 182 mph (293 km/h) with optional PDK and Sport Chrono package or 183 mph (295 km/h) with the manual transmission. 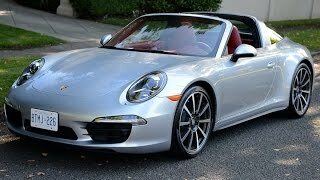 The new models will go on sale this summer, the 2014 Porsche 911 Targa 4 priced at $101,600 whereas the 4S version begins at $116,200.